Volunteer falcon watcher Glenn Nevill captured this mid-air food exchange between Dapper Dan (above) and Diamond Lil (below), a falcon pair nesting on the PG&E building in San Francisco. More photos can be seen on Nevill's web site. Evet Loewen organized the San Jose Peregrine Falcon Alliance. Photo by Amy Standen. It's become a rite of spring: Webcams at peregrine falcon nests in San Francisco and San Jose give people around the world an intimate view of falcon family life via the Internet. Now, as the fledglings prepare to take their first flights, volunteers have signed up in droves to watch from sidewalks and rooftops for hours at a time and, if the birds get into trouble, rescue them from urban perils. Glenn Stewart, coordinator of the UC Santa Cruz Predatory Bird Research Group (SCPBRG), said the citizen involvement in this program has been amazing. "I've got 73 volunteers signed up this year, mostly to help with the fledge watch," Stewart said. "We need people watching to make sure the fledglings don't end up on the ground and unable to get to a safe perch. If needed, we give the birds elevator rides up to the roof." Many of the volunteers get involved after seeing the falcons on one of SCPBRG's webcams and joining an online discussion group to learn more about the birds. "I put regular posts on the discussion groups to explain what's happening with the birds, like how fast their feathers grow. People ask questions, and over time they become very well-informed falcon watchers. It truly is educational," Stewart said. 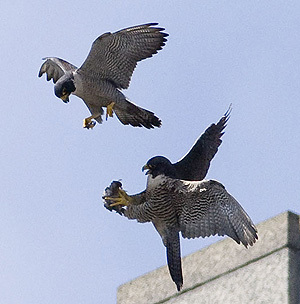 Peregrine falcons have been nesting on the PG&E building in downtown San Francisco since 2003. A webcam, operated by SCPBRG with funding from PG&E, has been monitoring the San Francisco nests since 2005. "People love the peregrines because they're beautiful birds, and they're an endangered species success story," said Glenn Nevill of San Francisco, who has been involved as a volunteer since 2005 and posts photos of the falcons on his web site. In San Jose, SCPBRG installed a nest box on a ledge at City Hall in 2006 after peregrine falcons were seen perching on the building. A webcam funded by the City of San Jose was up and running for the 2007 nesting season. Evet Loewen, chief deputy city attorney for San Jose, has been a driving force behind organizing the volunteers and getting city funding for the webcam, Stewart said. Loewen established a small nonprofit group, the San Jose Peregrine Falcon Alliance, to support SCPBRG and promote avian conservation and education. The group's activities include raising funds through a Cafe Press store, moderating the online forum, and running a YouTube site and a Flickr site featuring the San Jose falcons. Loewen said she began seeing raptors when she first moved into her offices in the new City Hall building in 2005, although she couldn't identify them until an experienced birder pointed out a peregrine falcon. 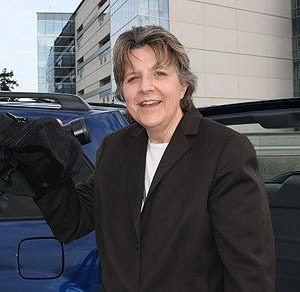 After learning about the San Francisco webcam and following the falcons there, she was determined to get a webcam for the San Jose falcons and began lobbying city leaders. "Once we got the webcam installed, we had a blockbuster first season, with such good press and people watching from all over the world," Loewen said. "Last year we had about a dozen volunteers, including one who flew in from Missouri. This year, one of our board members flew in from Michigan, and we have some volunteers who come from Nevada." In 2007, all three of the young in the San Jose nest "fledged up," meaning they didn't have to be rescued from the ground. But in 2008, all three fledglings had to be picked up and returned to the roof. "After that year, it was clear to me that we needed a larger, more organized volunteer group during fledge watch," Loewen said. "I wrote a proposal to establish a group of trained volunteers, and our organization got walkie-talkies for the volunteers to use." Stewart held training sessions in San Jose and San Francisco for fledge watch volunteers, and Loewen's group videotaped one of the sessions so that people who missed a session could still get trained. "It's an amazing thing to have all this support," Stewart said. "We are using the peregrine falcon as a gateway species for building public interest in the conservation of nature. People get interested through the webcams, then they buy a pair of binoculars, get interested in other birds, and they become conservationists." "This is one of those experiences that draws people in," Loewen said. "It's a great educational opportunity to learn about the natural world. We get comments on the forum all the time from teachers who use the webcam in their classrooms. It's an unparalleled opportunity to teach about conservation to a wide range of ages." Established at UCSC in 1975, the Santa Cruz Predatory Bird Research Group was instrumental in the recovery of the peregrine falcon population, which was in danger of extinction in the 1970s due to the effects of the pesticide DDT. During the population recovery effort, SCPBRG scientists released more than 1,000 captive-raised peregrine falcons into the wild. Stewart estimates there are now more than 250 nesting pairs in California. The peregrine falcon was removed from the federal endangered species list in 1999, and last year the California Fish and Game Commission recommended removing it from the state endangered species list as well. SCPBRG is now part of the Seymour Marine Discovery Center, a science education center based at UCSC's Long Marine Laboratory. The Seymour Center, which has a large group of volunteer docents, is helping to coordinate the SCPBRG volunteer programs. In addition to the fledge watch, Stewart has trained a smaller group of volunteers to conduct observations of peregrine falcon nests in the wild, building on 30 years of data collected by SCPBRG staff to track nesting success rates.